This cycle of threats, talks and weapons tests is familiar territory for the United States and North Korea. Here, we examine the turbulent history between the two countries. North Korea’s quest for a nuclear weapon can be traced back decades to the Korean War. “They felt that they needed to develop a capability that would deter an American attack,” said Duyeon Kim, a visiting senior fellow at the Seoul-based Korean Peninsula Future Forum. With the help of the Soviet Union, North Korea began work on a nuclear complex, and in the early 1980s, built its first power plant, Yongbyon. In these early days, Pyongyang insisted that its aims were peaceful. It became party to the Nuclear Nonproliferation Treaty (NPT) in 1985, and signed an agreement in 1991 with its rival South Korea in which both countries agreed not to produce or use nuclear weapons. But as the International Atomic Energy Agency (IAEA) pressed for access to the North’s nuclear waste sites, the country warned that it would withdraw from the NPT. In early 1994, North Korea threatened to reprocess fuel rods from its nuclear reactor, a step that would give it enough weapons-grade plutonium for five or six nuclear weapons. The Clinton administration considered various responses, including a strike on the Yongbyon facility, but eventually chose to negotiate with Pyongyang. Amid the crisis, Kim Il-sung — the founding dictator of North Korea, who ruled for more than four decades — died. His son, Kim Jong Il, took over as leader. 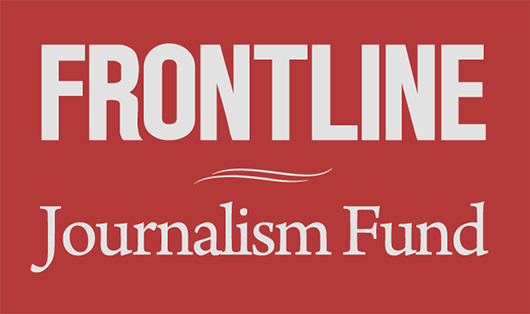 By October 1994, negotiations resulted in a deal known as the Agreed Framework. Under the framework, North Korea agreed to freeze and eventually dismantle its nuclear facilities, in exchange for a move toward normalizing relations with the United States. North Korea would also receive shipments of fuel oil and assistance with constructing light-water reactor power plants (which would have safeguards to ensure that fuel could not be diverted to weapons). 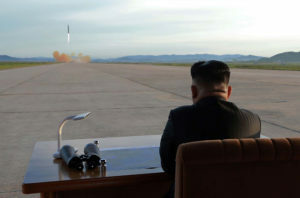 “The North Koreans agreed to the deal because there was a shift in the geopolitical situation in the late 1980s, early 1990s,” said Joel Wit, a senior fellow at the U.S.-Korea Institute at the Johns Hopkins School of Advanced International Studies and one of the negotiators of the Agreed Framework. North Korea shut down its nuclear reactor, and stalled construction of two others. In 1998, it test-fired an intermediate-range missile — the Taepo Dong-1, with an estimated range of 900 to 1,800 miles — that failed. Nevertheless, negotiations kept on. North Korea agreed to a moratorium on testing medium- and long-range missiles as long as talks with the U.S. continued. 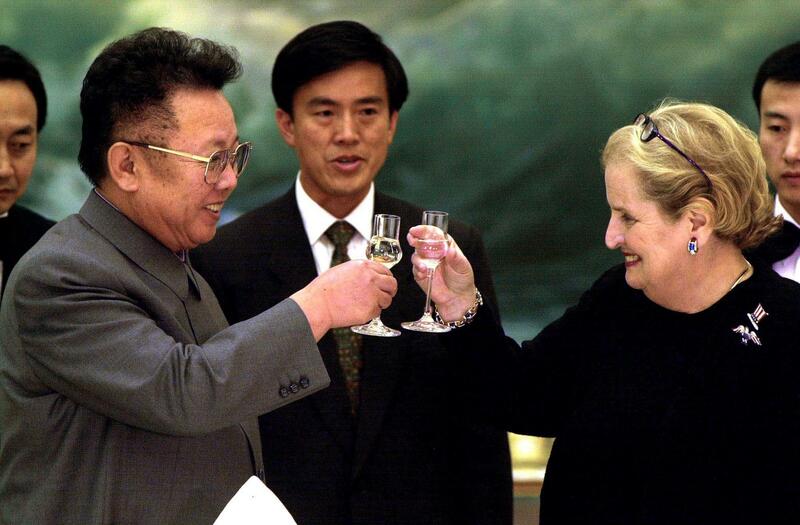 Madeleine Albright, then the secretary of state, visited North Korea’s capital in 2000 and met Kim Jong Il. The North Koreans hoped Clinton would also visit before he left office, moving North Korea and the United States closer to normalizing relations. But time ran out with the end of the Clinton presidency. Bush listed North Korea among one of three nations in an “axis of evil” in his 2002 State of the Union. Later that year, in October, the administration said that North Korea was secretly enriching uranium – a claim Pyongyang denied. A month later, the fuel oil shipments agreed to under President Clinton were suspended. By the end of 2002, North Korea ordered IAEA inspectors out of the country. The Agreed Framework had collapsed. By January 2003, the relationship hit a new low with North Korea’s official withdrawal from the Nonproliferation Treaty. Four months later, U.S. officials said North Korea admitted to having at least one nuclear weapon. The Bush administration would re-engage with North Korea later in 2003, joining South Korea, Japan, Russia and China in what came to be known as the Six Party Talks. The talks produced a joint statement in 2005 in which North Korea once again agreed in principle to give up its nuclear weapons program, rejoin the Nonproliferation Treaty and accept IAEA inspections, while maintaining that it had the right to peaceful nuclear energy. In exchange, the five other countries agreed to energy assistance and to discuss giving North Korea light-water reactors “at an appropriate time.” The U.S. and South Korea said they would not deploy nuclear weapons on the Korean Peninsula, and the U.S. and Japan said they would move toward normalizing relations. However, progress was short lived. In July 2006, North Korea — angered by U.S. targeting of its financial assets and the pace of the light-water reactor project — broke its 1999 moratorium on testing medium- and long-range missiles. It launched seven ballistic missiles, including the long-range Taepo Dong-2, which if perfected, would have the ability to hit Alaska. The missile failed. In October 2006, the situation reached a dangerous new stage with North Korea’s first nuclear test. The explosion yielded less than a kiloton, per the Nuclear Threat Initiative. For comparison, the atomic bomb that devastated Hiroshima was 15 kilotons. The regime’s rhetoric aside, the Six Party talks began to show dividends. 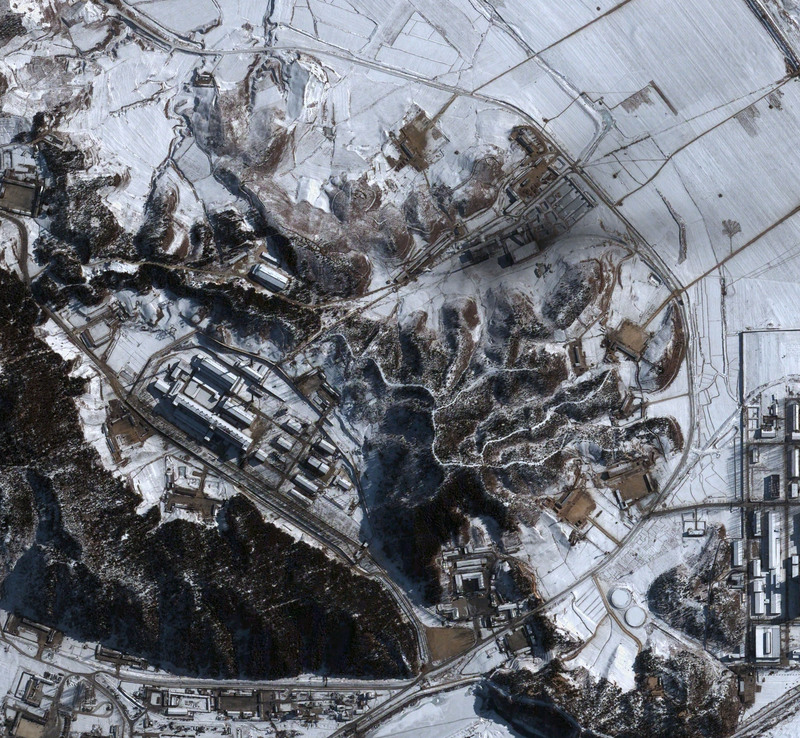 In July 2007, North Korea shut down its nuclear facilities at Yongbyon, a move confirmed by a visiting IAEA team. It also agreed to disable the facilities, which would make it harder to restart them. In return, it would receive fuel oil and be removed from the U.S. list of state sponsors of terrorism. However, disagreements on how to verify North Korea’s actions once again led to stalemate. Just three months later, North Korea launched a Unha-2 rocket with the goal of putting a satellite in space. The U.S. and its allies had warned Pyongyang they would consider the launch a violation of U.N. resolutions. The launch failed, and the Security Council again tightened sanctions. 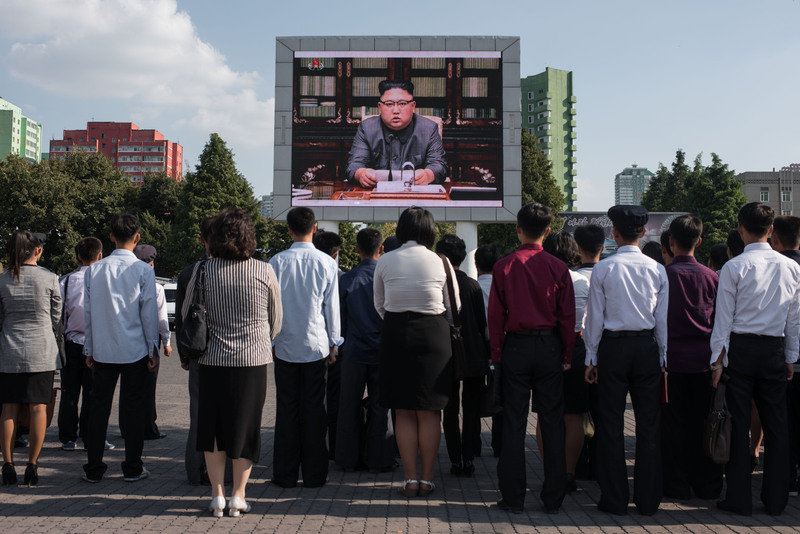 Pyongyang, in turn, said it would no longer adhere to any agreements from the Six Party talks and threatened to reactivate its nuclear facilities. Days later, it ordered IAEA inspectors out of the country. Then, on May 24, North Korea conducted its second underground nuclear test, estimated to measure four kilotons, according to the Nuclear Threat Initiative. In a statement, it said the test helped “settle the scientific and technological problems” in increasing the power of its nuclear weapons. Again, sanctions followed — first from the U.N. Security Council and then the U.S. By the fall of 2011, Pyongyang hinted that it would be willing to resume multilateral talks, but then suddenly, North Korean leader Kim Jong Il died in December, after holding power for 17 years. His youngest son, Kim Jong Un, was named North Korea’s leader. The pace of ballistic missile tests and nuclear tests would significantly escalate under Kim Jong Un. Despite agreeing to a moratorium on nuclear and long-range missile tests with the Obama administration in February 2012, North Korea once again attempted a space launch with the Unha-3 that April. But the test was a failure — the rocket disintegrated shortly after launch. The U.S. halted food aid in response. In December 2012, North Korea tried again, this time successfully launching the Unha-3 rocket and putting an object into orbit for the first time in its history. It maintained that the launch was for peaceful purposes. The rocket was similar in design to a missile that could possibly carry a warhead as far as California. The U.N. Security Council passed a new resolution a month later, condemning the launch and expanding travel bans and asset freezes for certain individuals and organizations. The international response would do little to slow the new leader’s nuclear ambitions. Between 2013 and 2016, North Korea held three more nuclear tests, each more powerful than the last. In September 2016, North Korea claimed to test its first hydrogen bomb, a claim that experts greeted with skepticism. It also continued to make strides in its ballistic missile program. In 2017, North Korea reached two significant milestones. It successfully test-fired its first intercontinental ballistic missiles in July, capable of reaching Alaska. It once again claimed to successfully test a hydrogen bomb. Whether it was indeed a hydrogen bomb has not been confirmed, but its nuclear test in September was recorded as North Korea’s most powerful yet at an estimated 250 kilotons. As his country prepared to host the Winter Olympics, South Korean President Moon Jae-in reached out to North Korea — inviting athletes from the North to march with their Southern counterparts in the opening ceremony under one flag. Kim Jong Un accepted the invitation and sent his sister as a representative. The détente offered an opening, and a senior North Korean official who attended the closing ceremony indicated that the North was willing to talk with the U.S. In mid-April, Trump confirmed reports that CIA Director Mike Pompeo made a top-secret trip to meet Kim Jong Un in North Korea in late March, the highest-level contact since Albright visited in 2000. The meeting came shortly after Pompeo was nominated for secretary of state. On April 20, North Korea announced that it would suspend nuclear and missile testing, and shut down the site where its six previous nuclear tests were carried out. In early May, Trump announced a date and location for the anticipated summit: Singapore on June 12th. Less than a week later, the plan was thrown into question when North Korea issued an angry rebuke to remarks by Trump’s new national security adviser, John Bolton. Bolton had suggested the U.S. plan to denuclearize North Korea might follow the “Libya model.” (In 2003, Libyan leader Muammar Qaddafi gave up his nascent nuclear program in exchange for sanctions relief. He was brutally killed a few years later by U.S.-backed rebels.) After Bolton’s statements, North Korea said it would have to “reconsider” its participation in the summit. After a White House visit from Kim Jong Un’s top deputy and former spymaster Kim Yong-chol on June 1, Trump said the summit was back on. The unprecedented meeting between a sitting U.S. president and a North Korean leader took place on June 12 in Singapore. “We had a historic meeting and decided to leave the past behind,” Kim told reporters while sitting next to Trump. Media reports noted that the language about disarmament in the statement was similar to agreements in 1994 and 2005 that eventually faltered. Trump and Kim held a second summit in Vietnam that began on February 27, 2019. After two days of talks, the leaders failed to reach an agreement. The American president said Kim wanted all sanctions on North Korea lifted, but didn’t offer sufficient dismantling of the country’s nuclear program in exchange. A statement from a North Korean official after the summit said the North wanted only “partial” relief from sanctions in exchange for dismantling “all the nuclear material production facilities” at the country’s main nuclear site at Yongbyon. This post was originally published on Oct. 4, 2017.